Political wife: Ever heard of a political husband? No? Me neither. Working mother: My personal favourite. Need I even explain why? What bugs me the most is that none of these terms works when they are turned on their head. Try dadpreneur, stay-at-home dad or even a working dad. Why would any dad not work, we fundamentally assume. And if they don't they must be one of the latest Scandi-inspired capuccinno dads. Lordie, let this madness not spread the other way... It's just as well I cooked recently for my blog guru, a thoroughly modern man. He is an entrepreneur creating downloadable children's stories, who looked after his toddler for years. Not quite the zesty, headline grabbing catch phrase we are accustomed to, but accurate nonetheless. 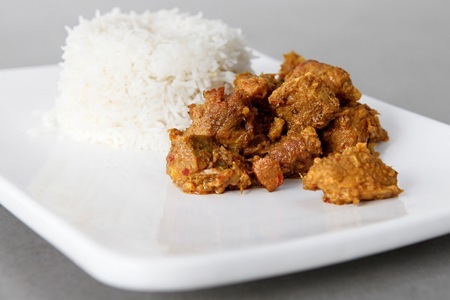 The fiery recipe is none other than a simple Pork Vindaloo. I have cooked it before. But a Goan cookery website with step by step piccies caught my eye. All this simple Pork Vindaloo recipe takes literally is the whizz of a collection of spices into a masala, a bit of marinating and it just stews away in a saucepan until the pork just falls apart in the mouth. A simple reminder that we can simplify even the most seemingly complicated things, without falling prey to bad habits. Chop the pork into bite-sized pieces. I tend to buy boneless pork shoulder and cut the fat off with a sharp knife for this. Cheap, but very tender meat. Dry roast the whole dry spices: red chillies, cumin, cinnamon, peppercorn, mustard seeds and cloves, Then grind this together all the ingredients bar the salt, turmeric, paprika, oil and onions in a blender to make the vindaloo masala paste. I have two important tips here a) add the turmeric and paprika to the pork separately so your blender doesn’t turn fluorescent and b) don’t put anything that has touched the vindaloo paste into your dishwasher unless you want to stain its other inhabitants acid pink. Next, mix the turmeric and the paste, into the pork. I tend to do this the night before, so the pork can absorb the flavours by the time you’re ready to cook. When you are, chop the onions into little pieces, get the oil to sizzling hot and saute them until golden. Then add the marinated pork, reduce the heat to medium high and cook covered for about an hour. Just make sure you keep stirring from time to time so the masala doesn’t get stuck to the bottom of the pan. An hour later, lid off, add salt to your taste and serve your simple pork vindaloo with piping hot Basmati rice, and some yoghurt to douse any chilli flames. I’ve tried the traditional Vindaloo,but this original Goan style is a must try for sure!!! I’ve tried the traditional Vindaloo,but this original Goan style is a must try for sure!!! Thanks a Ton for this..!! I can’t agree with you more on this! I keep getting ‘You look so young!’ when I am out with my daughter, and my reply to that usually is ‘I am young’ lol! It’s hard not to get affected by these stupid statements. Here here! And I look forward to blasting them all with some good old fashioned chili. 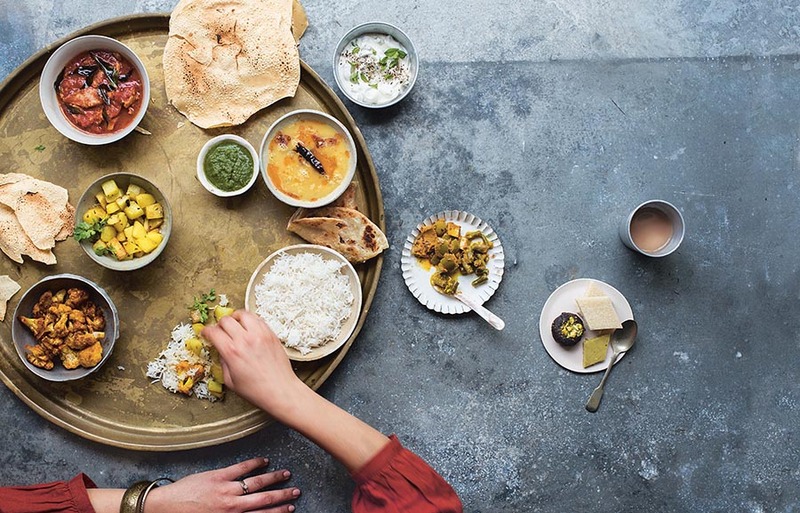 I love your recipe book and your blog, your recipes are fantastic for those like me that know nothing about Indian cooking but have an Indian to cook for! Thank you! Thanks for being a great “cooking mum” ( 😉 ) and providing us with such great recipes! We are always running ourselves into knots trying to be politically correct! And these labels… they all become labels after a point, dont they? Like Stay-at-home-wife/mum – wasnt that coined to elevate the status of the humble “housewife”? With many spices, I bet that this recipe is a sure fire and totally delicious. I tried this vindaloo and it came out sooo good that I’m finally doing what I should have done ages ago… leave a comment here to tell u that I try out your recipes regularly. the spinach pork, prawn pulao and this one are now my favourites. That’s so sweet. Thank you for letting me know! Thanks for your brilliant recipes, Mallika. I always enjoy reading them. And thanks, especially, for pointing out the stupid sexism in the way mothers are spoken about and to. Food blogs aren’t always the best place to find women wanting to stand up to the reductive mommy rhetoric. It’s great to see. Keep it up! What are the portions sizes for the ingredients ?